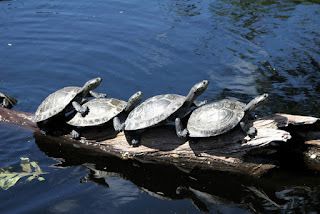 Story: The Lady and the 4 Turtles - Something New Everyday! Every Sunday morning I take a light jog around a park near my home. There's a lake located in one corner of the park. Each time I jog by this lake, I see the same elderly woman sitting at the water's edge with a small metal cage sitting beside her. "Hello," I said. "I see you here every Sunday morning. If you don't mind my nosiness, I'd love to know what you're doing with these turtles." She smiled. "I'm cleaning off their shells," she replied. 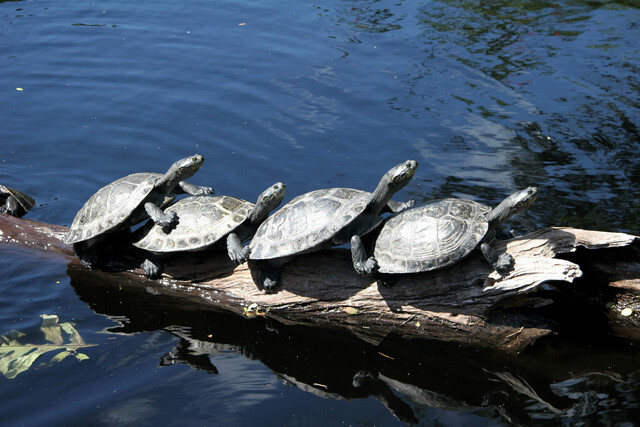 "Anything on a turtle's shell, like algae or scum, reduces the turtle's ability to absorb heat and impedes its ability to swim. It can also corrode and weaken the shell over time." "Wow! That's really nice of you!" I exclaimed. She went on: "I spend a couple of hours each Sunday morning, relaxing by this lake and helping these little guys out. It's my own strange way of making a difference." "But don't most freshwater turtles live their whole lives with algae and scum hanging from their shells?" I asked. "Yep, sadly, they do," she replied. I scratched my head. "Well then, don't you think your time could be better spent? I mean, I think your efforts are kind and all, but there are fresh water turtles living in lakes all around the world. And 99% of these turtles don't have kind people like you to help them clean off their shells. So, no offense… but how exactly are your localized efforts here truly making a difference?" The woman giggled aloud. She then looked down at the turtle in her lap, scrubbed off the last piece of algae from its shell, and said, "Sweetie, if this little guy could talk, he'd tell you I just made all the difference in the world."